Trail lovers, welcome to California! 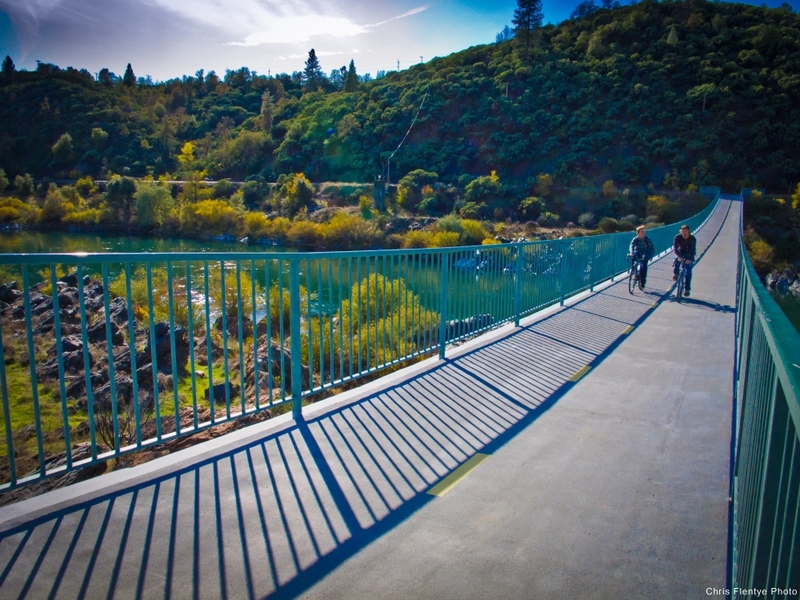 Located in far northern California, Redding is home to the Sacramento River Rail-Trail which has been awarded the 7th best trail in California by Rails and Trails Magazine. For more information about Rails and Trails visit their website at http://www.railstotrails.org. Enjoy the Rails and Trails RTC blog below from 2013 and we hope to see you making tracks on Redding trails soon! Rails-to-Trails Conservancy's Top Trails in California! Arguably the most scenic rail-trail in California, the spectacular 25.4-mile Bizz Johnson (right) was named to RTCs Rail Trail Hall of Fame in 2008. Connecting 12 cities in both Alameda and Contra Costa counties outside San Francisco, the Iron Horse Regional Trail is 24.5 miles of urban rail-trail at its very best. Its utility and popularity are set to expand even further with plans to extend the trail to 33 miles. What makes it so great? Connectivity. The 20-foot-wide trail connects residences, shopping districts and places of employment with schools, public transportation options, parks and other trails systems. TrailLink.com reviews sometimes note who crowded the trail can get. That's because it takes people where they want to go, a sure sign of a terrific urban pathway and an unbeatable justification for more like it. What makes it so great? Access to the outdoors. Rail-trails are ideal outdoor equalizers because of their typically flat grade and smooth surface. In a mountainous, rugged area marked by the majestic snowcapped Sierras, the Truckee River Bike Trail makes this stunning wilderness accessible for young families or older folks over their mountain biking days. What makes it so great? Riverfront revival. Locals say before the trail system the town was built with its back to the river, and little had been done to restore the waterway after years of mining and excavation. Now, the popular trails have brought renewed appreciation for the river and inspired a symbiotic movement of restoration. Stretching 86 miles through the way-out-there wild country in the states north east, the Modoc Line is not one for those eager to socialize and people watch. The rough surface and isolation of the Modoc Line make it better suited to ATVs than most bikes, however plans are in the works to improve some sections. What makes it so great? Big sky. Through remote ranch land and high desert landscapes, the Modoc Line has the character of an ornery outsider seeking refuge from the maddening crowds. You'll find it out here, along with wide open skies and spectacular star gazing, many miles from the nearest city. Along two different railroad corridors and stretching 28 miles across El Dorado County, the 28-mile El Dorado Trail showcases the unique natural surroundings and the history of the area.